Well, if New Year's is the drinkin' holiday, Thanksgiving is the eatin' holiday. But everyone knows that it's about more than that...or at least it's supposed to be. It's about family getting together, socializing, and giving thanks. That was the original intent of the holiday. Thanksgiving is my favorite holiday. Of all the holidays of the year, it's perhaps the most difficult one to commercialize. A lot of people can relate to this, I'm sure. But on a deeper plane, what's being said, here? Simply that holidays are commercialized, most notably the one that begins with a "C."
Why is that? Who does it? Who made it 99% commercial and stressful, and 1% joyful and relaxing? Answer: Everyone. All of us. You and me. But it doesn't have to be that way. It's just a matter of choice. Stay tuned for more in upcoming days. 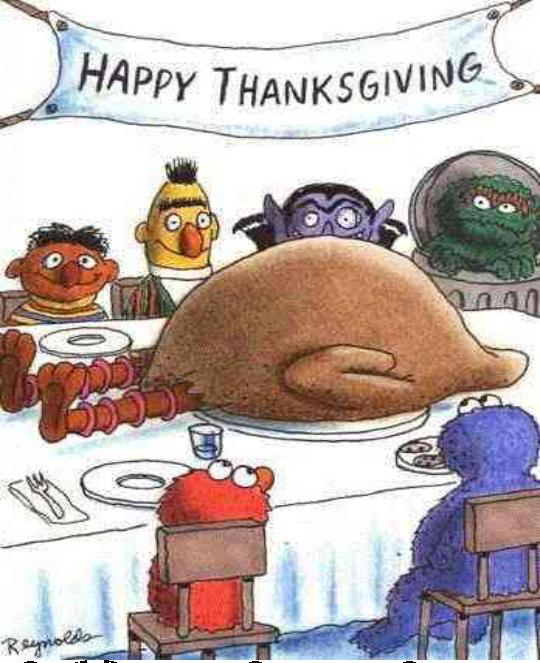 And HAPPY THANKSGIVING!